Seminar Topic: Fusion Power- Fusion energy features numerous qualities. It is a nearly unlimited energy source that does not generate any greenhouse gas effect or environmental pollution, and it features undeniable advantages in terms of safety. With adequate design, radioactive wastes from the operation of a fusion plant should not constitute a burden for future generations. In this article we have provided you two most relevant pdf papers that will help you to understand and study the technological and scientific feasibility of fusion energy. 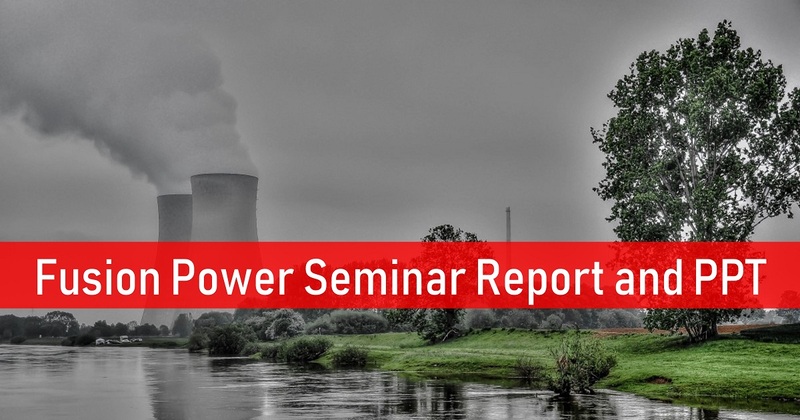 The pdf papers will help you to draft fusion power seminar report. The article also contains fusion power ppts which would help you to get the ideas and prepare fusion power seminar powerpoint presentation. First PDF paper for seminar report is titled as Nuclear fusion – energy for future by Marek J. Sadowski. Abstract - This invited paper has been written on the 50th anniversary of the Institute of Nuclear Research (IBJ). The introduction describes basic nuclear fusion reactions and the appearance of high-temperature plasma, as well as different methods of the plasma generation and containment. The first part of the paper contains a concise description of the present status of research on controlled fusion and the construction of a thermonuclear reactor. The most important results of experiments oriented on magnetic confinement fusion (MCF) or inertial confinement fusion (ICF) are characterized. The second part of the paper presents a story of high-temperature plasma research carried out at IBJ (and now continued at IPJ) at Świerk. The main experimental facilities and scientific results, as obtained with those, are described. The most important achievements of IBJ (IPJ) researchers in the field of plasma physics and technology are indicated, and in particular: invention and development of the so-called RPI facilities producing intense plasma-ion streams, discovery and experimental study of a new configuration of a magnetic trap called the spherical multipole (SM) configuration, development of various plasma diagnostic techniques, and the optimization of different plasmafocus (PF) facilities. Second Fusion Power PDF paper which will focuses on the final objective of controlled fusion research: the energy-generating fusion reactor. This report focuses only on the most developed: the magnetic fusion-based concepts. Worldwide studies have been done, or are ongoing, with the main goals to prove their credibility, reliability, and economic viability and that the advantages of this type of reactor in terms of safety and the environment are respected. Fusion Power ppt explains the benefits, fusion reactors working , applications and the challenges. Three ppts have been provided which will give ideas to make powerpoint presentations for your seminar and discussion. Resources of natural fuels undergo destruction and might be exhausted, and the conventional fission reactors have difficulties with radioactive wastes. Therefore, the mastering of fusion is of great importance for many nations all over the world. We hope this article will help you in your seminars.All the best!